Cooperative Development Institute is the Northeast’s center for cooperative business development. Founded in 1994 by cooperative leaders across industry sectors, CDI’s mission is to build vibrant economies through the creation and development of successful cooperatively structured enterprises in diverse communities across New England. CDI’s focus is rural and regional, but its efforts contribute to innovative economic development strategies on national and global levels. For more information, click here or write to Cooperative Development Institute (info@cdi.coop) or call 413.665.1271. ROC USA, LLC helps resident corporations buy their manufactured home communities or “mobile home parks” from private community owners. 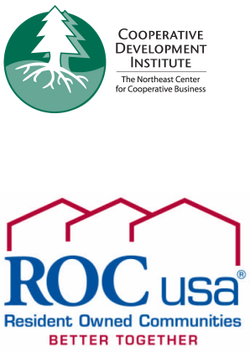 ROC USA is a non-profit organization with a mission of making quality resident ownership possible nationwide. We do this by first focusing on communities that are for sale and where homeowners have a strong likelihood of success if they choose to work as a group and buy it. Second, we have assembled local and regional non-profits that we have trained and certified to assist resident corporations through the purchase process and beyond. Third, we have developed a specialized source of financing for resident corporations who wish to buy their communities.